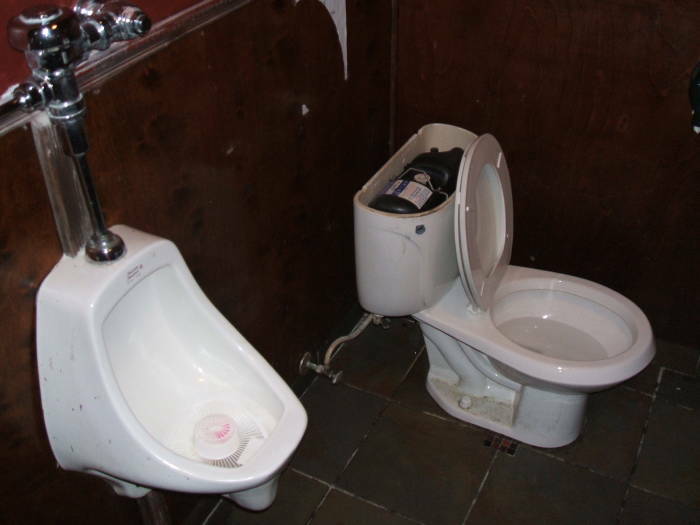 Pressure-flushing toilets are especially common in cities in the U.S. The ceramic tank is not used as a water tank. It holds a plastic pressure vessel of maybe one-third to one-half the ceramic tank's volume. That pressure tank contains a sealed air bladder. When the tank is filled from the water supply line, the tank fills with water until the air bladder compresses to the point that the tank pressure nearly equals the water supply line pressure. The result is a flush using half or less the usual amount of water under much higher pressure than normal. Unlike the weak "low-flow" toilets now required for new installations in the U.S., this system has a chance of effectively flushing the bowl. 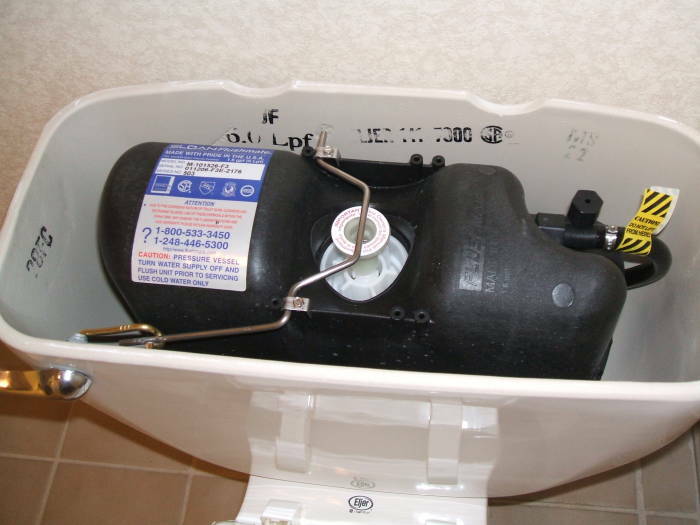 You can see the pressure tank inside a pressure-flushing toilet in the Hawthorn Suites hotel, 467 Herndon Parkway, Herndon, Virginia, USA. I was staying in the hotel while on a business trip, and removed the lid on the toilet in my room. This second pressure-flushing toilet is in the 51st Street Tavern at 2512 L Street NW in Washington, D.C.
No, I didn't take the lid off, I found it this way. Also see my high-tech toilet page.